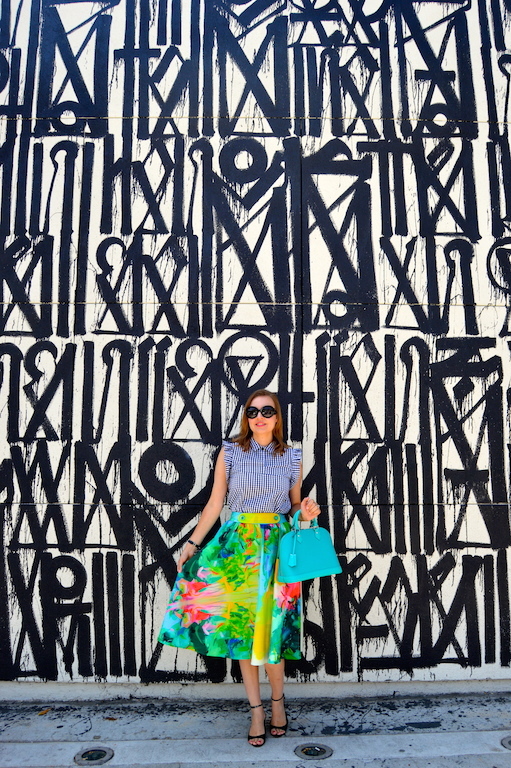 West Hollywood is the place to go if you want to find fantastic walls and street art. The mural below is by an artist known as RETNA and it features a print that is vaguely reminiscent of ancient writing or hieroglyphics. It's actually located by a restaurant called Craig's. When I googled Craig's, a bunch of pictures of the Kardashians showed up, so I assume it's sort of a hot spot for certain celebrities in Los Angeles. When we were done taking these photos of yours truly, I took a few snapshots of just the wall on my iPhone. Apparently, the iPhoto app on my phone is linked to my Facebook page, which scares me because I don't remember allowing that, and it put together a collage of pictures. Facebook titled the collage Katie's Night on the Town, but then just produced a slideshow of random wall photos I had taken in broad daylight. It was a little strange, but, I guess, so is this wall! So, I might not exactly be dressed like a Kardashian, but I am wearing one of my favorite skirts from Anthropologie that has a painterly print as well as a gingham blouse that I love to use for a little bit of pattern mixing. It might not be the kind of thing that would get me photographed by the paparazzi at night, but it was the perfect thing to wear while strolling around West Hollywood looking at murals and stores during the day! What i Wore ,Style Me Wednesday, Fresh Fashion Forum, Oh Hey Girl! You do manage to find some of the very best walls for your photos. This is one of my favorite walls in LA (and Craig's in my favorite restaurant! ), and this by far is one of my most favorite look on YOU! That skirt is everything!! I love the colors on that skirt. It must be great to live near some cool photo spots. You have the prettiest skirt collection! love the vibrant colors on this one you've featured here. Such a fun wall! And I love your skirt! Looking at it makes me happy! :-) Perfect pattern mixing, too! And how fabulous is that bag!!!! Love the wall and love the pattern mixing! You're making me want to go on a wall hunt of my own in KC (because here in the 'burbs the walls are slightly bland). My FB does that too, although it doesn't post anything, it just suggests what I could post, which can be annoying (especially when it's just 7 random office outfit selfies in a row...). 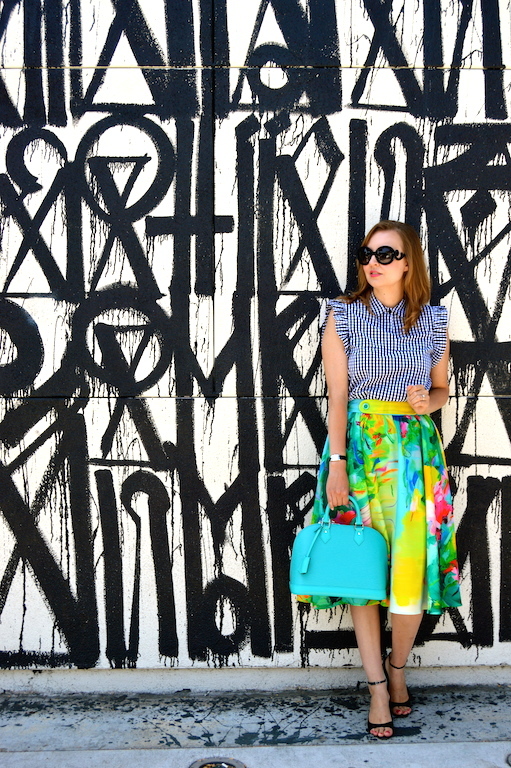 What cool wall art and your outfit really pops! I hate when things link up without my knowing it! Even if it's not a big deal, it feels like a violation, right? Oh and as always, do I even need to say it ....print mixing PERFECTION! Fabulous! I love the gingham with the printed skirt. 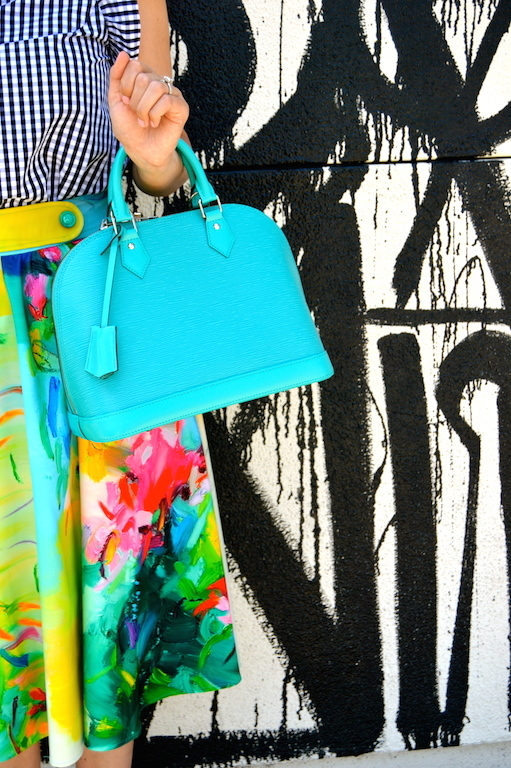 Such a bright and cheerful look! And you are certainly paparazzi-worthy because you look like a star in this gorgeous outfit! I feel so sheltered and never venture anywhere. Great outfit and always love the art you find in LA.